Superhero fiction works best when we identify with the character. Superman is an unreachable ideal of humanity, whereas Batman represents an attainable mirror image of that (plus money and childhood trauma). Spider-Man is right between those two because he’s more relatable. In the unlikely scenario that a dorky, well-meaning teenager got bitten by a magical eight-legged McGuffin – and was granted powers rather than, say, instadeath – he would still be a dork. No matter how much good he did, his powers would still mess up his life. Sam Raimi’s Spider-Man trilogy understood this. Still, it felt a bit off because Tobey Maguire’s Peter Parker was better than his costumed counterpart. The two Amazing entries starring Andrew Garfield got Spidey right, but his Peter was too confident. Now comes Spider-Man: Homecoming, the first webslinger movie co-produced with Marvel Studios. I’m happy to report that the sixth time is indeed the charm. The film immediately grounds itself in the Marvel Cinematic Universe (MCU). New York cleanup and reconstruction crews vie for a piece of the pie after the catastrophic invasion of the first Avengers film. One of these teams, headed by engineer Adrian Toomes (Michael Keaton), gets its contract revoked. 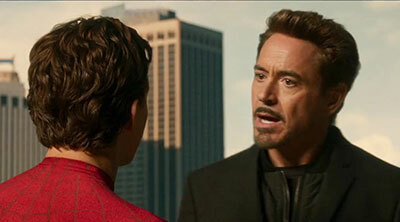 The new Department of Damage Control, co-created by Tony “Iron Man” Stark (Robert Downey Jr.), takes it over. To get by, Toomes and fellow tinkerer Phineas Mason (Michael Chernus) decide to reverse-engineer Chitauri debris they collected. They build gadgets and weapons to sell on the down-low, chief among them a set of vulture-like flying wings. The two masterminds and their enforcers (Bokeem Woodbine and Logan Marshall-Green) scavenge for more tech to sell. Years go by while the world at large is distracted by the Ultrons and Hydras of it all. Enter brilliant, overeager and super-powered Peter Parker (Tom Holland), a high-school student whose online masked crime-fighting antics got the attention of Tony Stark back during Captain America: Civil War. Parker returns to Queens after lending Tony a hand in Berlin, a sleek spider-suit as his reward. He’s instructed to lay low and patrol his borough until Happy Hogan (Jon Favreau) calls with a new mission. So Peter kills time balancing typical high school and home life drama while catching the occasional carjacker. Often with comically undesired results. Then he encounters goons armed with Toomes’ tech during an ATM robbery. Spotting an opportunity to ingratiate himself with his metal-suited mentor, he sets on discovering their source. Toomes and his cronies thus become hell-bent on stomping out Spidey before their actions attract unwanted attention. Spider-Man: Homecoming delivers all this information with top-notch use of film language by Jon Watts, a fresh new director with two full-length features who paid his dues on the video version of The Onion. What took me two paragraphs above to explain, the movie gets across during the first five-to-ten minutes. I praised The Amazing Spider-Man, but complained that it has so much going on that it got difficult to process. I’d argue that there is much more happening in Spider-Man: Homecoming, but you never feel like you miss a beat. There’s a scene in its second act that is a master class in subtlety and “reading between the lines”. This despite just being about three people driving a car. Its minimalist suspense reminded me of the staircase climax in Alfred Hitchcock’s Notorious. It also riffs on a very similar moment in Raimi’s first Spider-Man, yet what was slightly campy in that instance comes off as menacing here. The first thing going for Spider-Man: Homecoming is the hero’s costume. A clear nod to Steve Ditko’s original design, it’s the best movie rendition of Spider-Man’s look so far. What also pumps new blood into this 15-year-old, twice-rebooted franchise is reconnecting the character with its roots in more ways that one. 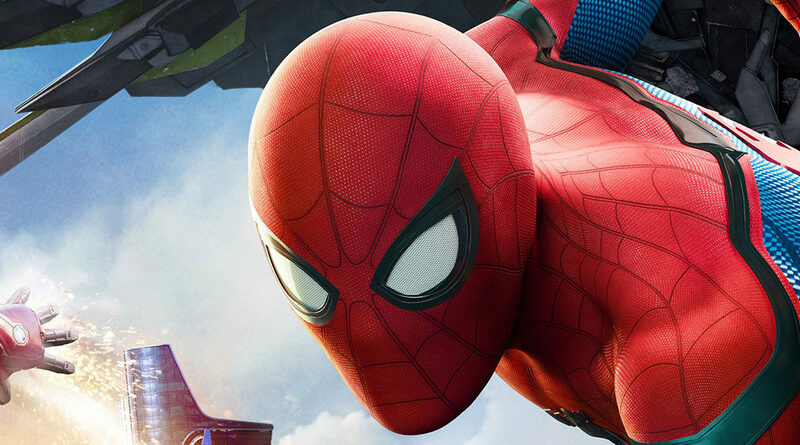 The deal Sony Pictures made with Marvel Studios for Spider-Man: Homecoming means Sony keeps all its web-slinging royalties as long as they’re open to share the characters they licensed with the people responsible for creating them in the first place. Although the plot here is good enough to work on its own, bringing Spidey into the sandbox he indirectly helped built means he’s part of a larger universe where anything literally is possible. Gone is the need to retell a “rich kid, dead parents” origin story (“bit by spider, ‘great power’ speech, dead uncle”, in this case). This reboot is an origin, yes, but it skips the “how” in favor of the “why”. Being now an official part of the MCU means that Spider-Man: Homecoming, as well as future Spidey films, will receive the Marvel Studios genre-bending touch. The mass appeal of Avengers-related movies is due in part because few constitute “mere superhero flicks”. The flagship Iron Man borders on science fiction. Thor films are Shakespeare plays with a dash of Scooby-Doo. Captain America: The First Avenger is a throwback adventure in the vein of The Rocketeer and Indiana Jones. Iron Man 3 is a spy flick. Captain America: The Winter Soldier is a subversive Tom Clancy thriller. Ant Man is a heist. Guardians of the Galaxy is a space opera straight out of 70’s rock album covers. Doctor Strange is M.C. Escher on an LSD bender. And so on. In case it wasn’t obvious, Spider-Man: Homecoming is an 80’s John Hughes teenager-in-high-school film, appropriate for its puberty-stricken hero. The Ferris Bueler’s Day Off foot chase is a dead giveaway. Spidey’s school refreshes every single Hughes archetype with a welcome sprinkle of diversity. Flash, the jock (Tony Revolori), is now a smart preppie. Liz, the love interest (Laura Harrier), is a congenial girl-next-door. The school staff (Kenneth Choi, Selenis Leyva, Martin Starr and Hannibal Buress) is protective but oblivious. So is Aunt May (Marisa Tomei), the parental figure. Ned, the dorky best friend (Jacob Batalon) is… the same, but the hero is dorkier. Plus, their chemistry is priceless. Michelle, the outcast, is played with Daria-worthy non-effort by scene-stealer and Disney Channel alum Zendaya. We also two small but memorable scenes with Donald Glover as a street thug. It’s a credit to all the cast that every portrayal in Spider-Man: Homecoming is spot-on. The actors give their interactions a weight even some of the visual-effects sequences in the film can’t match. Still, let’s face it, audiences fill superhero screenings to get bang for their buck. Spider-Man: Homecoming doesn’t disappoint. Granted, the scale of the effects-heavy action sequences are scaled down to fit into the teenage-movie mold, yet it’s not a complaint. Josh Trank’s Chronicle showed that fitting full-blown super-powered battles within small confines actually makes them stand out more rather than become muddled (looking at you, Transformers franchise). You get three big set pieces here to avoid complaints, first on the Washington Monument, then in a ferry and finally in the skies above New York City. Still, it’s as if Watts and company realized they would never top the wall-to-wall action in Spider-Man 2, the best spider-film up to this one. Their possible conclusion? “How about we focus on every aspect other than visuals and make a better movie?” In any case, they borrowed their best special effect from Marvel Studios, and it’s Robert Downey Jr. in full RDJ mode. As I’ve said before, the man nobody but Jon Favreau wanted for Iron Man is the anchor of the entire MCU, and only he deserved to welcome the most iconic Marvel character back to his comic book family. 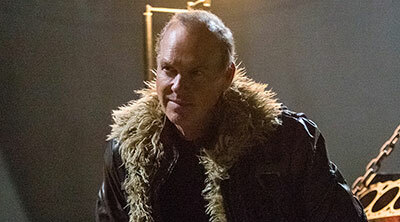 Likewise Michael Keaton, as the big bad, stands out with his trademark charm and intensity. Here he adds another hit in his hot-streak since Birdman or (The Unexpected Virtue of Ignorance). Although his Batman paved the way for gritty movie superheroes, I was always partial to his darker turns like Bettlejuice, Desperate Measures and RoboCop. Rather than evil, Keaton plays Toomes as a pragmatist who’s willing to pay the price that keeps food on his table. His Vulture is a perfect foil to Holland’s naive Spider-Man, and their showdowns are electrifying. It has been a great so far for comic hero movie fans. Hugh Jackman and Patrick Stewart bid farewell to their X-Men roles with Logan, their R-rated Wolverine-by-Peckingpah swan song. Guardians of the Galaxy Vol. 2 did quite well for itself financially. The wonderfully upbeat Wonder Woman finally gave female superhero fans someone they can proudly root for. Spider-Man: Homecoming adds one more name to that list as well as, I dare say, to the pantheon of best superhero movies of all time. AUTHOR’S NOTE: In case you were wondering my spider-ranking from best to worst, it’s Spider-Man 2, Spider-Man: Homecoming, The Amazing Spider-Man, Spider-Man, The Amazing Spider-Man 2, Spider-Man 3. Raimi’s 2 is hard to beat, but I feel that Homecoming might take the top spot after repeat viewings. Movie description: An enjoyable return to form for the quintessential comic book character, Spider-Man: Homecoming gets a push in the right direction from his Marvel Cinematic Universe peers.